Sole2Soul Wellbeing is a new exercise programme set up for people who are seen by our Community Mental Health teams (CMHT) or by our Psychology and Psychological Therapies teams (P&PT). It aims to help people into exercise by offering a variety of different supportive options to get active. While the programme is primarily designed to target people in Exeter, it is not closed to other CMHT/P&PT teams outside of the city – if people are prepared to travel then they are more than welcome to join the groups. The classes are led by Charlotte Giles, a personal trainer and mental health nurse, who will deliver FREE, FUN and FRIENDLY classes suitable for all fitness levels. Typically, the classes will offer a mixture of body weight exercises and games, and at the end of each class there will be some stretching and relaxation. There will be no pressure during the class – the aim is for people just to have fun and get active. During the project people will also be signposted and supported to access other activities in the local community. Clinicians can refer to the group by emailing dpt.sole2soulreferrals@nhs.net and by completing this short referral form with the interested person. 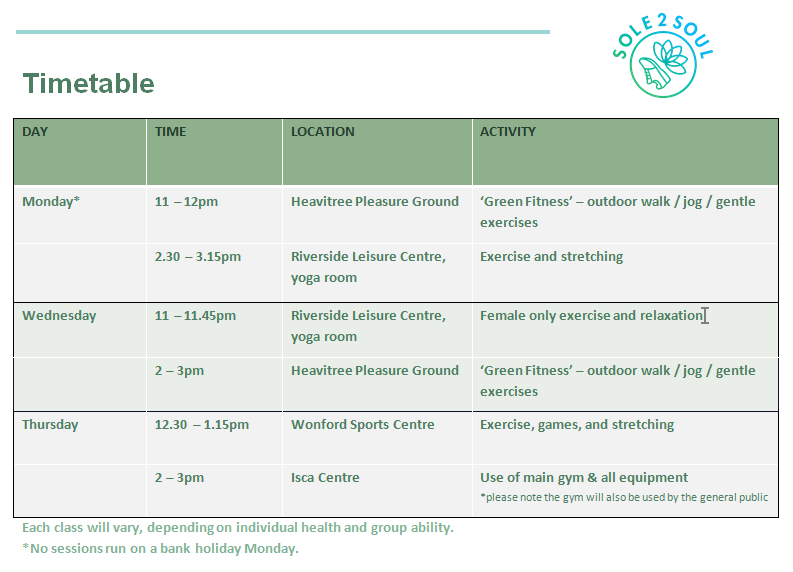 Please see the timetable below for the variety of options offered.